My biggest pet peeve lately has been having to plug my iPod nano into my laptop to charge it since I don't have a wall charger for it. Well, thanks to Powermat, now I can simply throw my iPod onto the charging dock and be done! 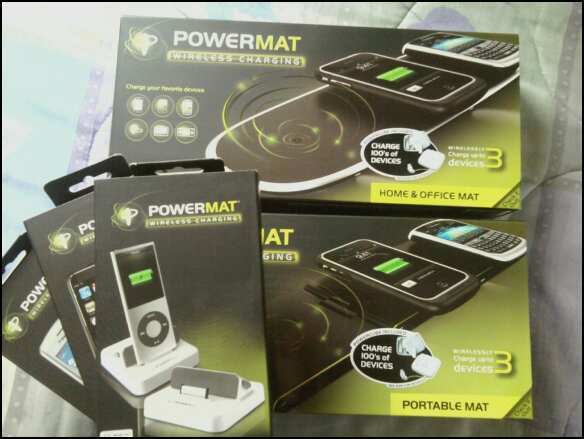 I received the Powermat Home & Office Mat as well as the Portable Mat to review, plus the receivers for the iPod, iPod Touch, and Blackberry. When I first opened the Home & Office Mat, I thought it would take a lot of work and reading of instructions to get set up. But it was so easy! All I had to do was plug the Powermat into a wall outlet then attach my devices to their appropriate receivers to set on the Powermat. 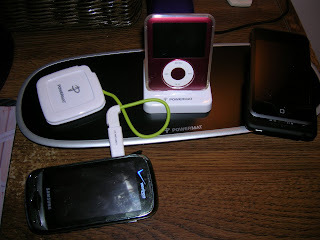 I was also able to charge my Samsung phone using the Powercube that came with each Powermat. It comes with 8 different tips to fit most devices, and sure enough, my phone was compatible with one of the tips! It's a little more of a hassle having to use the Powercube since I still have to plug my phone into it rather than just setting it down like the other devices with receivers, but it's still more convenient than having to use a phone charger. And it's nice to have all of my devices charging in the same place too! It can charge 3 devices, plus it has a USB port to charge another device externally. One unfortunate thing is that my iPod touch is a 1st generation, so the docking device that I received didn't fit correctly because it's for a 2nd gen. 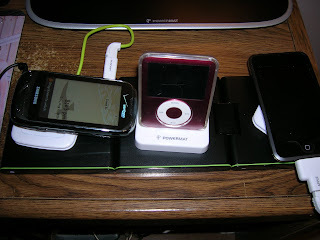 But, since I had another Powercube, I was able to use the Apple tip to connect it to the iPod touch, so I was still able to charge it! The Portable Powermat was just as simple to set up and use as the Home & Office Mat. It was essentially the same thing, with the big difference being that its three sections fold up so that you can put it in the included hard carrying case to take along with you on trips. I also tested out folding it up into a square and then setting one device on top to charge, and it worked; So you could fold it up to save space if you only wanted to charge one device. The Powermat is so easy to use and pretty amazing to be able to charge so many different devices at once! It doesn't take up much space, and it is so much nicer than getting out my iPod cord to plug into my laptop or finding my phone charger cord to plug my phone in. Plus it looks pretty cool sitting on my desk too. I would definitely recommend the Powermat to anyone with multiple devices who wants to "Lose the Cords" like the Powermat motto says. Thanks Powermat! Disclaimer: I was given Powermats free of charge for the purpose of this review. All opinions are my own experiences with the product. Individual results may vary. No other compensation was given. thanks so much i was wondering about that! !